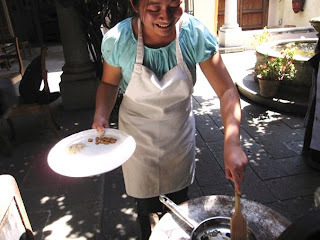 Cookbook Series: Happy Birthday, D.! On our last day in the Bay Area, we had dinner at this family-run restaurant in San Leandro. Tsuru Sushi is, somewhat surprisingly, run by Cantonese-speaking Chinese people. Given the diaspora of the Chinese, especially the southerners, it isn't a huge stretch to find Chinese families running Japanese restaurants. In fact, there are quite a few in the San Gabriel Valley area of LA. The food is pretty good. I haven't tried the sushi, but the good dishes are more than decent. 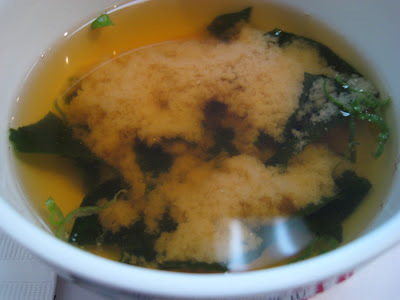 I liked the miso soup, which isn't too salty. My favorite thing about this place is their tempura. Very few places make it like this anymore, with a crispy, flaky, and almost translucent skin. My tempura don (tempura on rice) was pretty good. 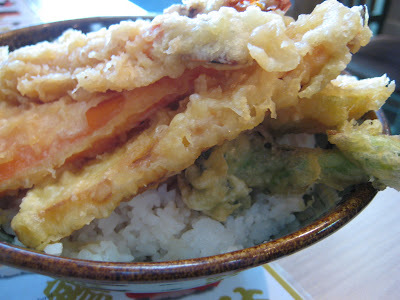 Very, very filling, with a huge pile of crisp tempura on a bed of fluffy sticky rice. It was all drizzled with the light soy sauce used for tempura-dipping. It's a very rich dish, considering it's rice with fried stuff, but I wouldn't have it any other way. Good place for basic Japanese food. The one big downside is that they're rather pricey. Their beef teriyaki combinations ran for $16.95... eek! The portions are generous, but the price is still too high.